Wich would u like to get, the cacti the dyckias or both? 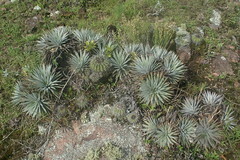 Hi Constantino, it is good to see some pictures of hot(ter) places and great plants during the Scottish Winter. D. ebdingii looks to have really robust and symmetrical rosettes - very attractive! Here Nick, the landscape reminds me that of your homeland, fields and hills, rolling hills. In the winter the sun may me also migger and the coldness a disgustfull presense. We are in South. The cold south wind makes you feel as it is way down freezing point. Be nice, be good and brave, behave and remember William Wallace!